What’s a girl to do when she heads home for the holidays to the deep South, and I mean deep? We’re talkin’ all the way down to the Gulf Coast. We’re talkin’ boiled crawfish, fried crab fingers, beignets, and Dixie beer. We’re talking pecan pie, gumbo, fried okra, and oyster stuffin’ on Christmas day. We’re talkin’ deep, fried mullet and cheese grits deep. 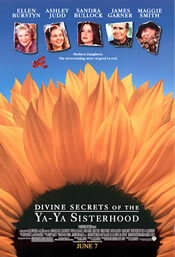 Why rent The Divine Secrets of the Ya-Ya Sisterhood, of course! I was busy with work in the city and never got around to seeing it in the theaters, so here was my big chance to slip into some jammies, microwave some popcorn, settle down on the couch with my mother, and enjoy that most maligned of all genres…the chick flick. Although we did make it to the end of the film and we did shed the requisite number of tears, I must admit we both felt dissatisfied at film’s end, and I, cultural critic that I am, asked myself why. We wanted to love the movie. It was written and directed by the Oscar winning writer of Thelma and Louise, Callie Khouri. The story was adapted from the best selling novels by Rebecca Wells. I mean, we really wanted to love a film made by such cool chicks. In fact, I almost cheered out loud when I saw the “All Girl Productions" credit during the opening moments. So what was my problem? Then suddenly I realized something…I wasn’t too busy with work to see the film in theaters. I was avoiding the film because I didn’t want to be disappointed by a woman’s film yet again. So, of course, I returned to my question. Why were we disappointed with this film? Why did it fail to be a big box office hit? While Divine did gross $69 million with a $27 million dollar budget, certainly it was profitable, it fell far short of the mark that signifies a hit in Hollywood, $100 million. Although it has made the top ten list in terms of video rentals, “users" on the Internet Movie Database website (www.imdb.com) only grant the film 5.9 out of ten stars. Apparently, we weren’t the only ones who were disappointed. Perhaps the main problem I had with the film sprang from the very fact that I am southern. Putting aside the observation that the accents were positively atrocious, what southerner can buy the plotline that a little girl, Sidda (Sandra Bullock), could grow up in a small Louisiana town and never have heard the stories or have seen some of the pictures that the Ya-Yas revealed to her during her kidnapping? She grew up in the very heartland of the oral tradition, more commonly known as gossip central; Sidda would have known Vivi’s (Ashley Judd, Ellen Burstyn) story. At the very least, most of it. And then there’s the fact that we southern women are a little tired of being defined as the craziest and most dysfunctional women in the United States. From Beth Henley to Faulkner, from Flannery O’Conner to Tennessee Williams, southern women have been stereotyped as alcoholic whackos throughout most of twentieth century American literature. Can you imagine the outrage if any other group were consistently portrayed in that manner? But the most annoying part of all is the pat forgiveness in the closing scene on the porch between mother and daughter and earlier in the film in the bedroom between husband Shep (James Garner) and wife. I know the film was trapped within the confines of the Hollywood arc and the need for resolution within two hours, and I know the filmmakers were going for an out when Vivi explains that there are some sins for which she does not expect to be forgiven, nevertheless both her husband and her daughter do offer her forgiveness for such atrocities as moving out of the bedroom, egomaniacal rages, destruction of property, drug addiction, alcoholism (which presumable is still an issue), abandonment, child endangerment, emotional and physical abuse…and this is just the short list. The forgiveness from husband and daughter is far too quick and easy (husband Shep simply tells her he married her for better or for worse). I remember viewing a rough cut of Runaway Bride on the Disney lot for Garry Marshall a few years ago. Maggie’s (Julia Roberts) father (Paul Dooley) is an alcoholic, and in one scene toward the end of the film he is in the kitchen holding a mug. He points to the cup and says, “Coffee." I, along with many other viewers of this early cut, commented that change (especially for an alcoholic) is never that cut and dried, that clean. Indeed, for those who have endured such relationships, a scene like that is downright insulting and dismissive of the severity of the problem. The scene was omitted from the final cut of the film. Rather than feeling sympathy for Vivi, most viewers are so horrified by her behavior we wonder why the two in question want to have any relationship with her at all; indeed we wonder why Vivi has any friends, the Ya-Ya sisterhood, in the first place. It may be possible that this problem is one of the central problems in the genre of the chick flick. The films typically deal with severe emotional trauma—which many filmgoers don’t want to deal with in the first place (they go to the movies to escape trauma and get a little entertainment, after all). Then the film attempts to resolve these serious issues in about two hours. Audiences need more time to work through the problems and journey toward this magical land of forgiveness. A novel gives them that needed time; a film does not. Maybe there’s something to the belief that some stories are better told on screen and some stories are best reserved for the space of a five hundred (or at the very least two hundred) page novel. Hey wait a minute…could this be one of the divine secrets of the American box office?